is designed to meet the criterion "1 MOVE for 1 INTERVAL", (thus rewarding the well placed finger with the expected sound) and has other advantages as well. There are twelve times fewer chordshapes to learn, twelve times fewer scales to learn - if at all - and the stretch of the hand is reduced by 14% - without sacrificing roominess. The 6-6 keyboard, by permitting a single hand-form for each chord-type regardless of keynote, brings the simplicity of the guitar to the left hand. The 6-6 keyboard offers complete freedom in the placement of the thumb undertuck. This is because every note can be played by either one of two keycaps arranged in rising receding rows so that the top keycap is easily reached by the fingers, while the lower one is convenient for the thumb. This means that no matter what scale you are in, there are no bad habits to avoid! Which in turn means that you can practice exactly how and what you want and no “harm” can come of it. This releases teachers and students to explore less mechanical topics. No hanging about waiting for big industry to wake up, Alex built this Janko conversion out of Lego and is currently working on a more solid aluminium version. 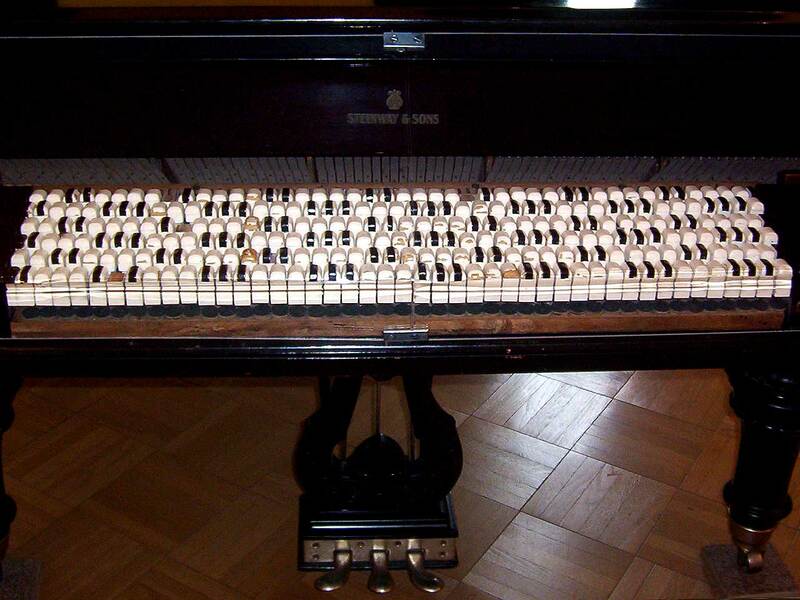 Prior to the conversion the original white keys were all trimmed to the length of the black ones. There are six tubes per octave in the wholetone panpipe. Each tube can be played open (tube flush with the chin) or shaded, (with the flute raised so that the lower lip covers some of the hole) to lower the note. Using just a single practice tube, some of you will be able to lower the open note by a full fifth after only a day's practice. This raising and lowering of the flute may seem a cumbersome operation to anyone who has acquired a certain amount of fleetness on a finger driven instrument, but so long as the panpipe is sufficiently light, a simple wrist or finger action is soon mastered, and the flute flaps happily away as if the jaw has sprouted a wing and is soaring on it way to who knows what heights. You can adapt a diatonic panpipe to wholetone by leaving the bottom notes as they are up to the first semitone. Then insert wax shavings, which you melt with a heated iron bolt long enough to reach the bottom without touching the sides. DON'T pour melted wax into a panpipe, it sticks to the sides. DON'T overheat the iron bolt or the wax will spit. As a rough guide a 6% increase in length makes the tube go down a semitone, and a 5.6% decrease makes it go up one semitone. Use a tuner and be prepared to keep retuning the instrument as your blowing technique develops. Bass panpipes are too big to go tipping them up and down, so we make them chromatic by providing a second row, which also happens to act as a reinforcement to the glue joins. They are made on a form with a diameter of 50 - 55 cm. I used the back of a wooden chair someone had thrown away. Because of the wider diameter they need shaping at the mouthpiece end. For my use I made a wooden mould with hole cutter and carving gouges, and rammed the heated end of each tube into it until the plastic cooled. For those who can't face this idea and are rolling in money there is the stereolithography alternative presented below. Because you can decide on the scale at the prototyping stage, one stl. file is good for all sizes. Since these are not on sale yet you have to take a saw to a regular xylophone. Pull the string out of the keys, remake the frame shorter, and rethread the keys in the right order. It's not ideal as the keys are drilled aslant and the direction depends on which row they are in. When you make the conversion some of the keys will change row. Usually the resonators (the tubes underneath) can be changed round or else they have a moveable stopper to tune them with. School xylophones are a lot easier. Never having made one of these, I have no tips to give other than try it out on xylophone first. They are cheaper. This is not exactly the same disposition of notes as the honeycomb which you will find by exploring the Atlas of Tonespace (button at left); for one thing the web has been turned through 30 degrees to give a playable instrument with 3 octaves and a bit. This will play most four-part chords with a pair of beach flip-flops. The shape for each chord quality remains the same regardless of base note. It will improve both your interval and spatial awareness. If you're ever down Florida way, visit the Stephen Collins Foster State Folk Culture Center at White Springs and ask if they will let you try this wonderful specimen out (click the picture to enlarge). For more about Paul (von) Jankó click on his button below.